Folks who are wondering what kind of faith is practiced at that little white church on the common or that gigantic cathedral with the colorful stained glass don’t tend to look up at the windows for answers. They look down - at their computer, tablet, and smart phone screens. But just having your church’s location and hours of worship isn’t enough. Potential visitors will be looking for a clear, compelling depiction of who you are and whether they will be welcomed. And doing that well requires more than finding a cool template or using the latest website platform. For some churches in the Massachusetts Conference, it has meant hiring professionals. That’s what First Church in Cambridge, Congregational, UCC did and according to Senior Minister Daniel Smith, the result has been clear: a rise in newcomers. "They are telling us they found us on the web and that they loved our site,” Smith said. 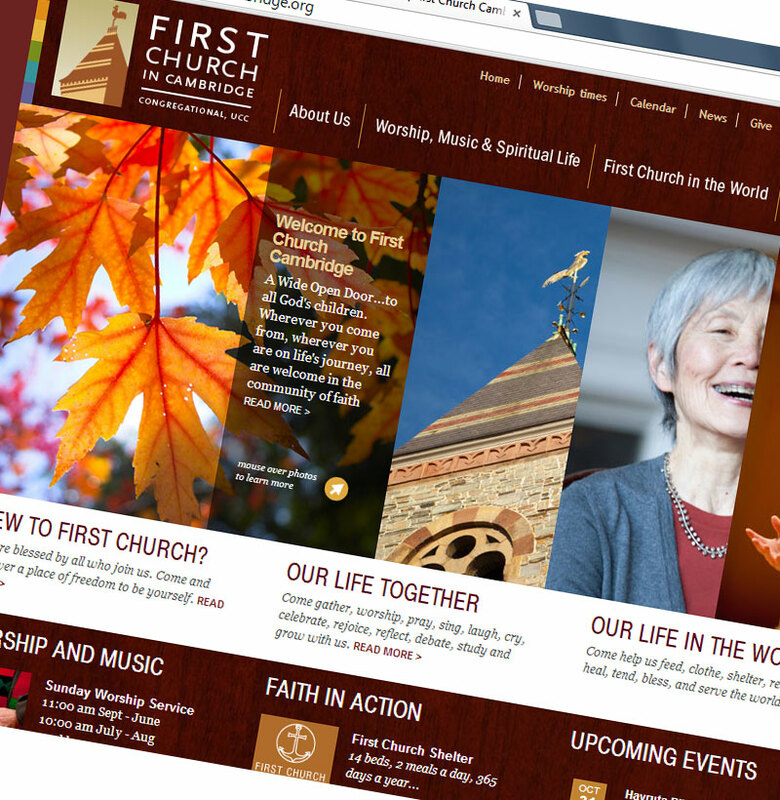 First Church in Cambridge’s website was created by Theory One Design, a local firm responsible for the websites of several church websites in the Massachusetts Conference, including Old South Church in Boston, Wellesley Village Church, Congregational, UCC, United Church of Christ in Norwell and United Parish in Brookline. Each of these websites has a different look and feel, because Theory One did not simply adapt a church template for each. Instead, the small firm studied each church to find which individual stained glass story should be depicted on the website. Pritt can rattle off what her team found at each church they worked with. Many churches have chosen the Theory One Design team because of their deep commitment to getting the church’s message right. Pritt says it is vital for a church to crystalize an understanding of who they are and what message they are trying to convey before they begin a website project. Pritt’s team also helps churches re-align their expectations of what a website can do versus the resources available. They believe that a good website needs constant attention, with fresh content. They always incorporate a non-proprietary content management system, which is important as it allows the churches to keep the sites up without too much expertise. They also remind the church that their website is always available to the public, but it is not self-running, so it needs a good project manager. “The project works best when the website is utilized as a core communications tool, and as such, it needs constant revitalization to convey the feeling that the church is alive and vibrant,” explained Pritt. In fact, Old South anticipates they will be redesigning their site every 2-3 years. For churches engaging professional firms like Theory One, a website can be a significant investment. Old South used a memorial fund and First Church Cambridge made it an early part of their capital campaign. They believe it was well worth the investment and the effort. The Theory One team members are grateful to do this work and found it surprising how their faith lives and professional lives have intersected. The group is small and they come from different faith backgrounds, each presently attending churches different than they ones they grew up in, but they all agree that a church website can be a form of ministry. Have you started the dialogue with your potential visitors yet? Not ready to hire professional help for your site, but looking for resources? A link to the Church Communicators Wiki, which includes a free Wordpress template and instructions for using it to set up a church website. A subscription box to join a Google group of other church communicators around the Conference. Also, considering signing up for a Nov. 16th communication event for lay and clergy leaders called "Find Your Voice and Start a Chorus." Geldert and other communication experts will lead a series of discussions on how churches can discern their stories and effectively communicate them.